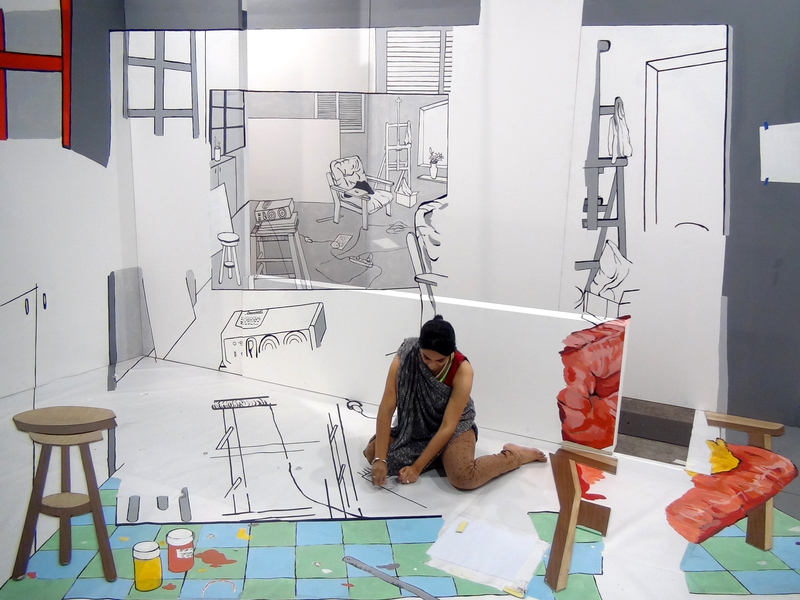 Project Description: Viewers walk through a constructed studio space of painted objects and architecture encountering strange geometric shapes and gestural marks. 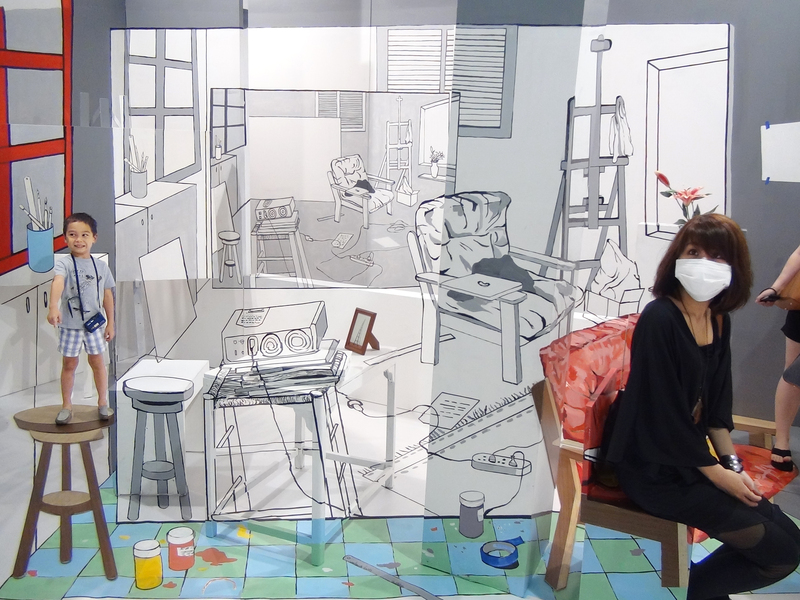 They look up to see themselves in a live video projection where they appear to be walking through a completely different studio space, made up by the alignment (from one vantage point) of all these strange painted forms around them. 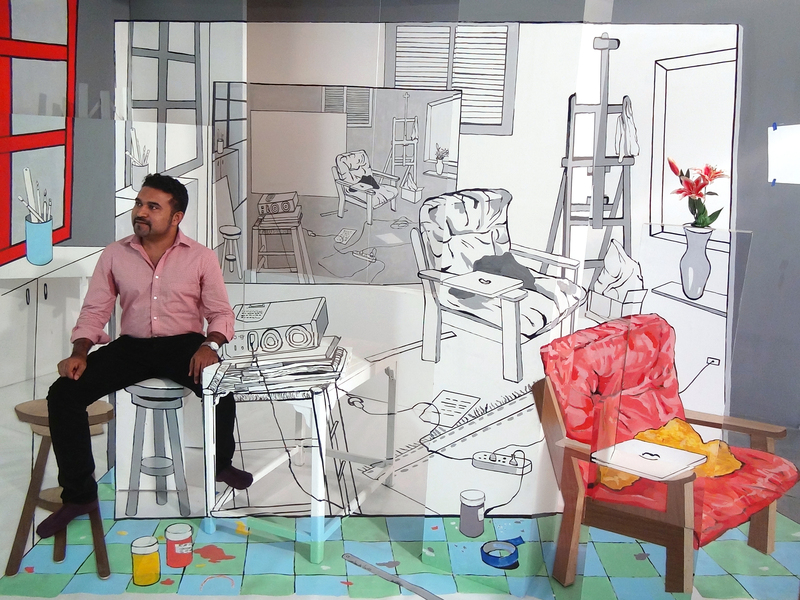 Medium: Acrylic and stained wood on vinyl floor, canvas walls, wooden furniture and column, 15ft X20ft X10ft. 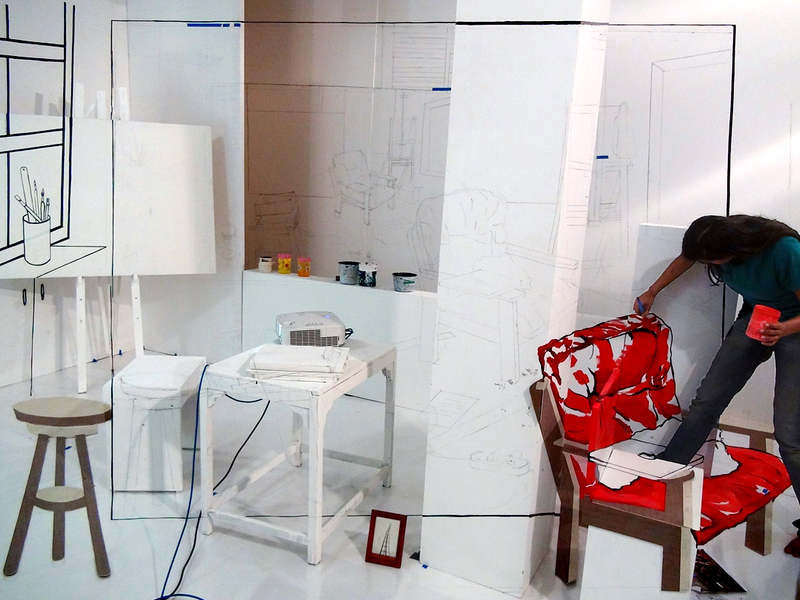 In “Backstage: Onscreen” viewers walk through a constructed studio space of objects and architecture, painted white to become ghostlike versions of their physical selves. 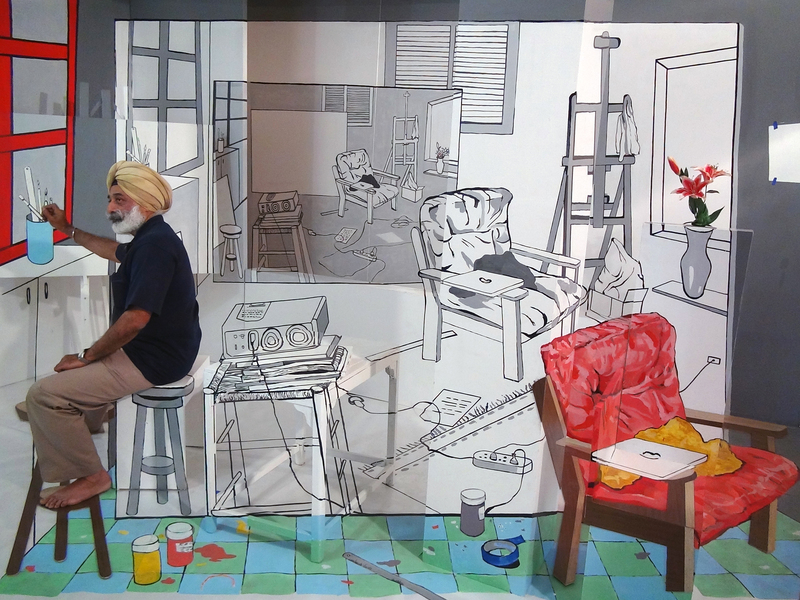 Painted upon them, one encounters strange geometric shapes, gestural marks and skewed bits of representational painting. 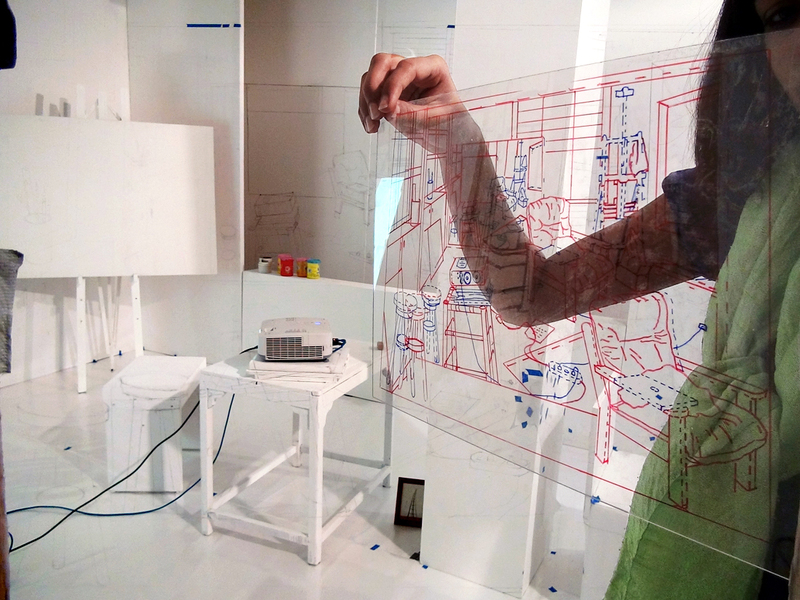 Viewers suddenly look up to see themselves in a live video projection where they appear to be walking through a completely different studio space, made up by the alignment (from one vantage point) of all these strange painted forms around them. 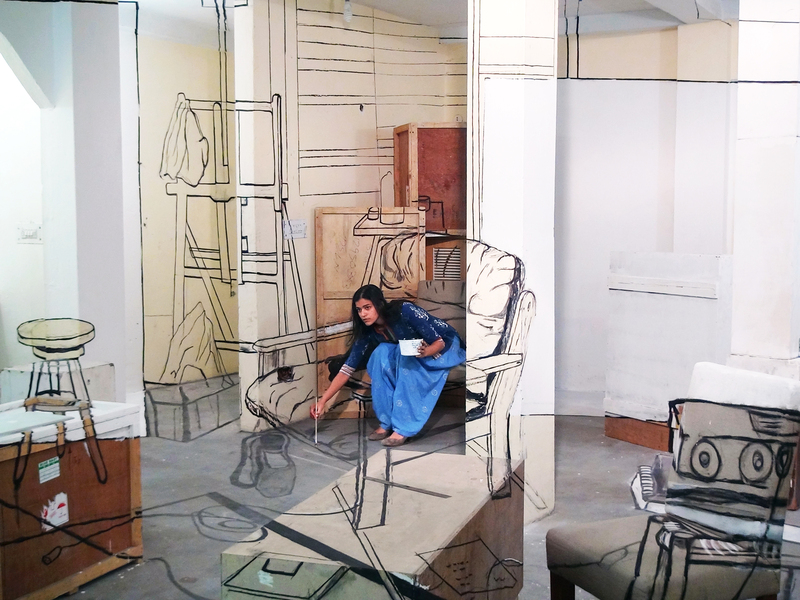 The real objects turn invisible through camouflage while the lined up illusory image takes dominance as the “reality” onscreen. 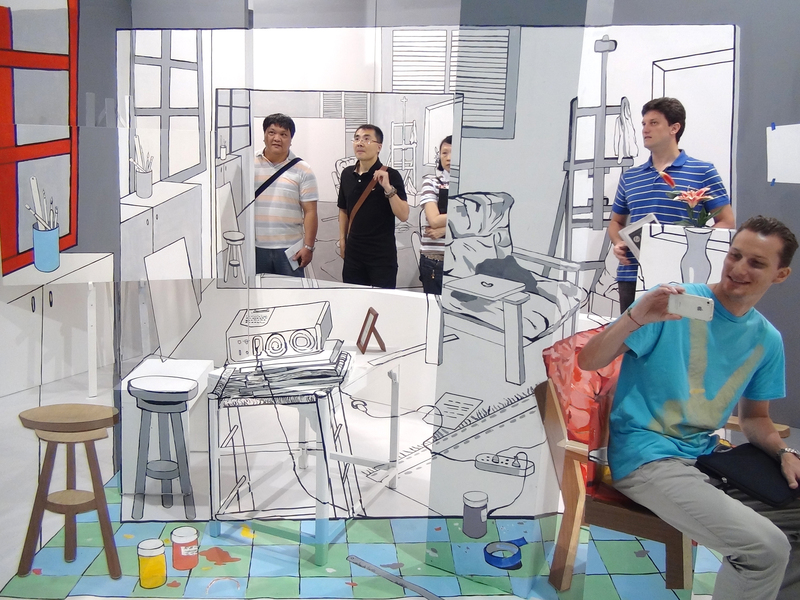 Here viewers turn to watch their virtual selves moving though black and white paintings like a living character, walking through solid seeming furniture, unbound by laws of physics, sitting on a drawn stool or disappearing into a painted easel! 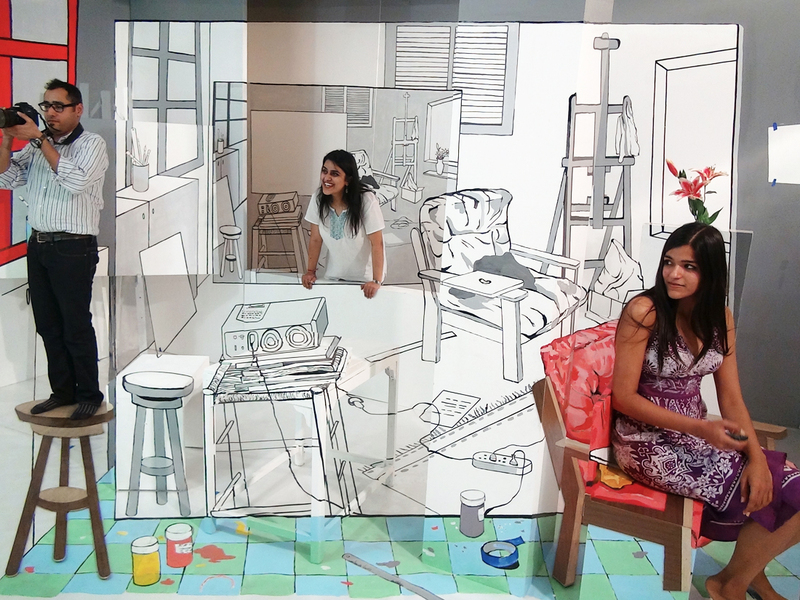 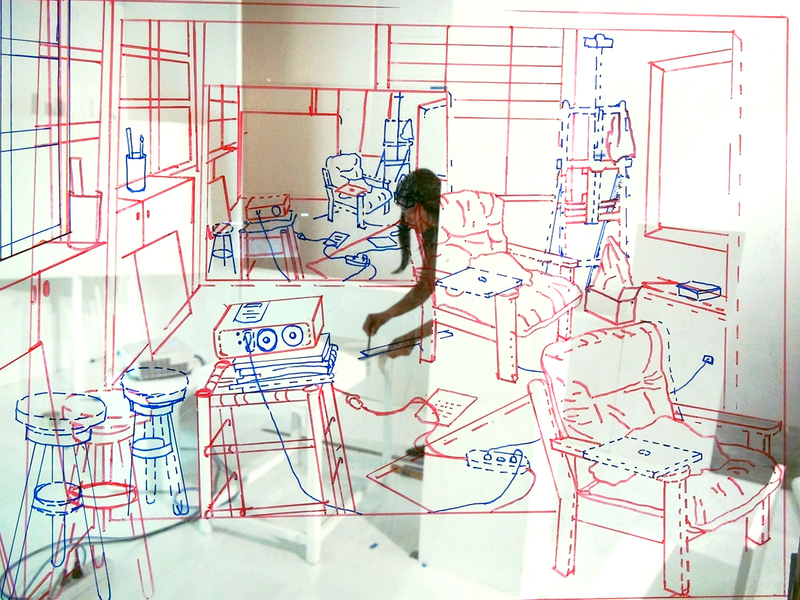 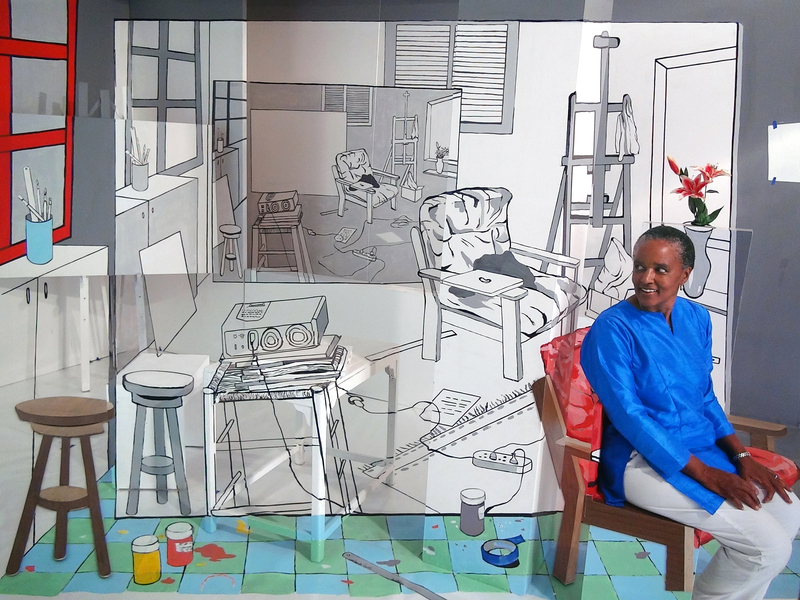 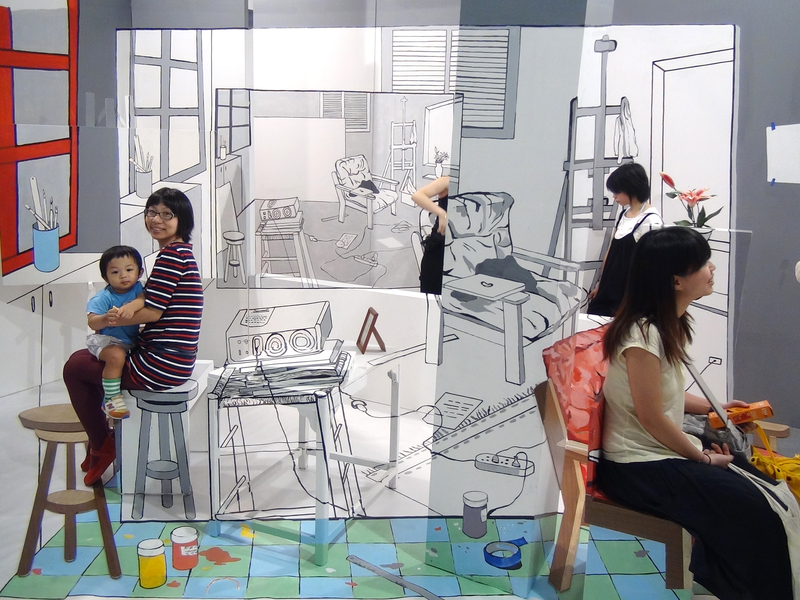 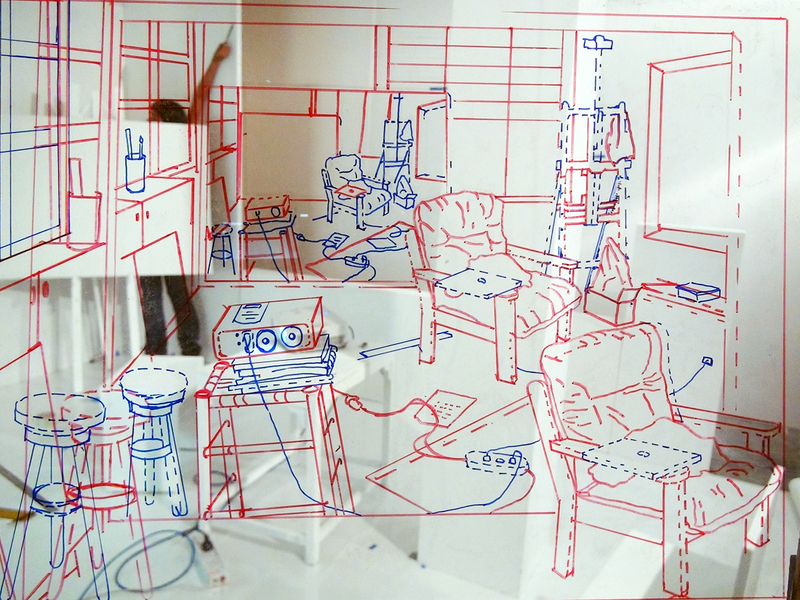 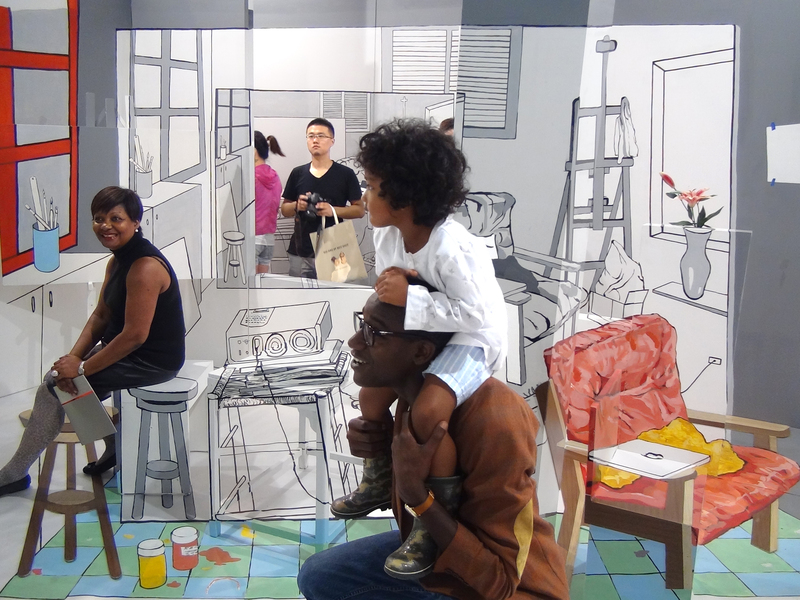 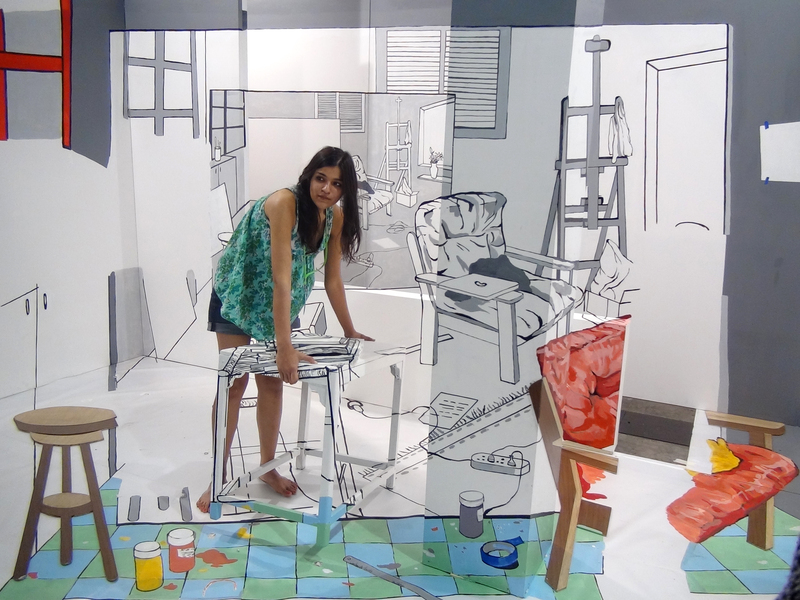 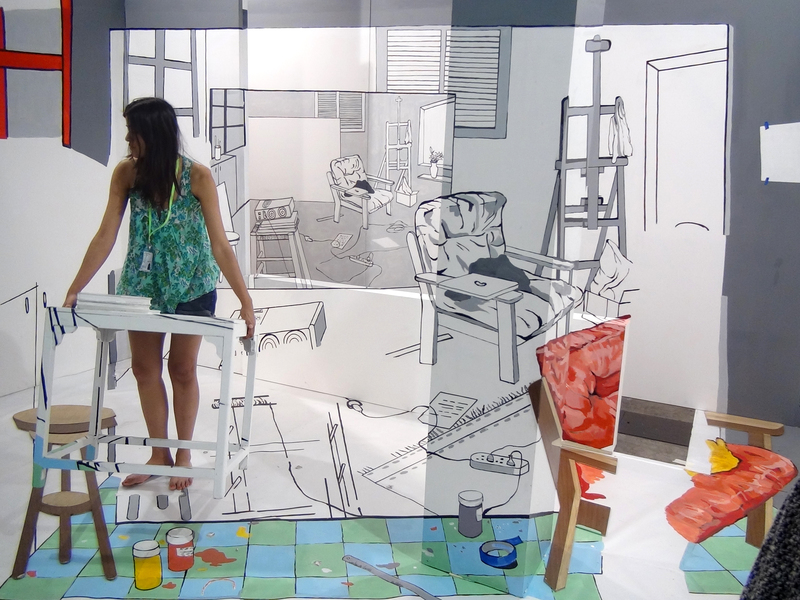 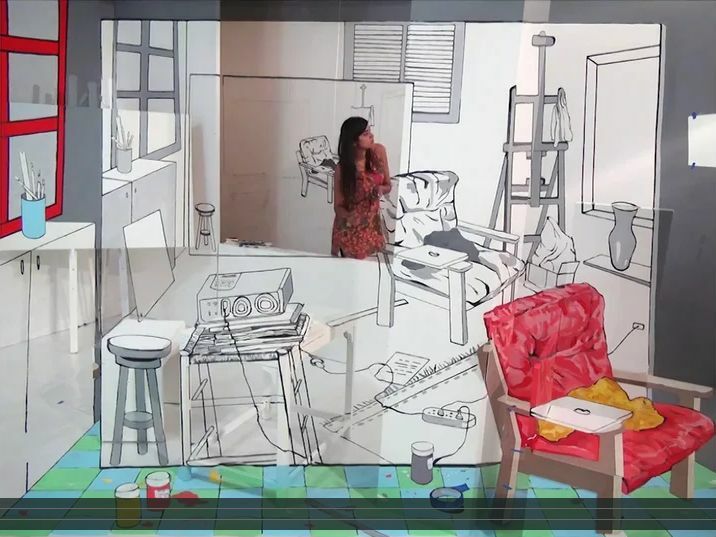 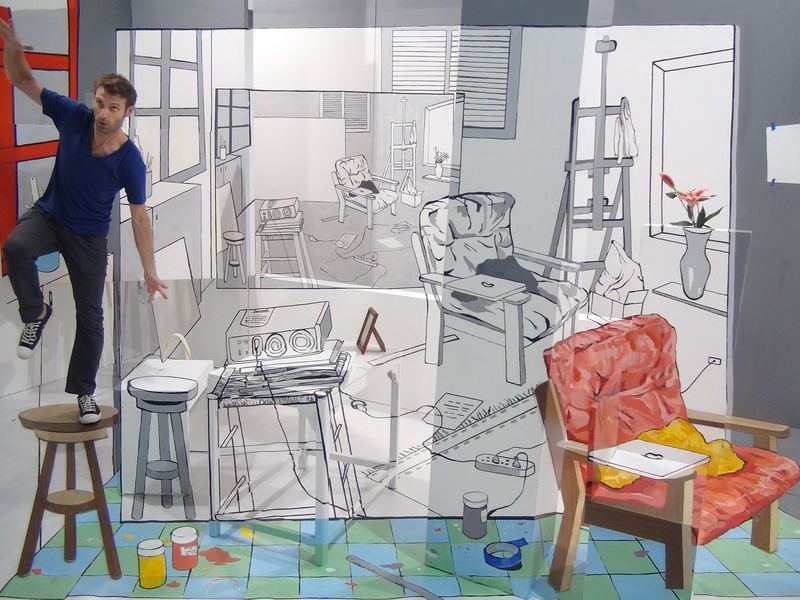 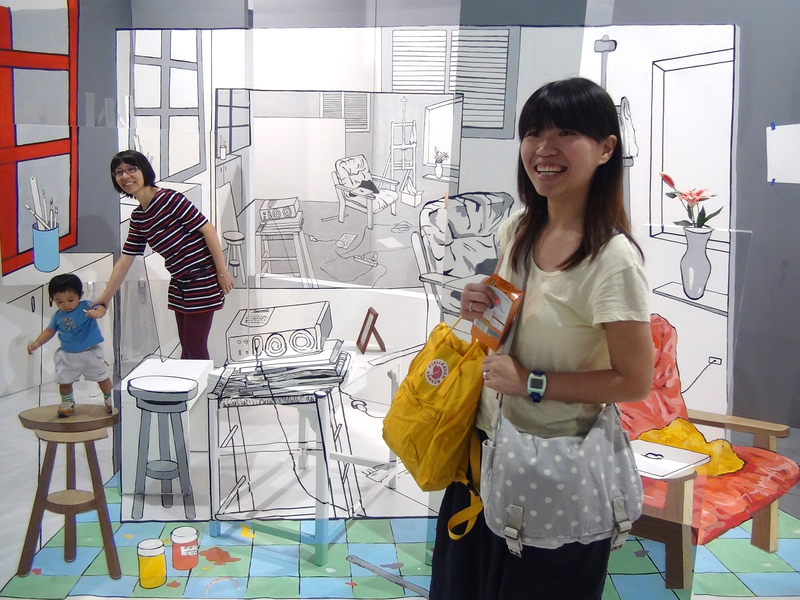 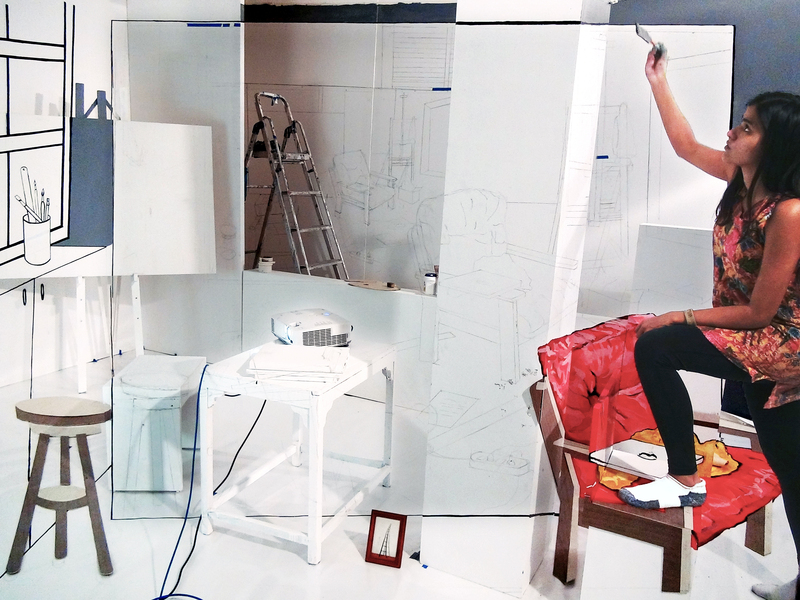 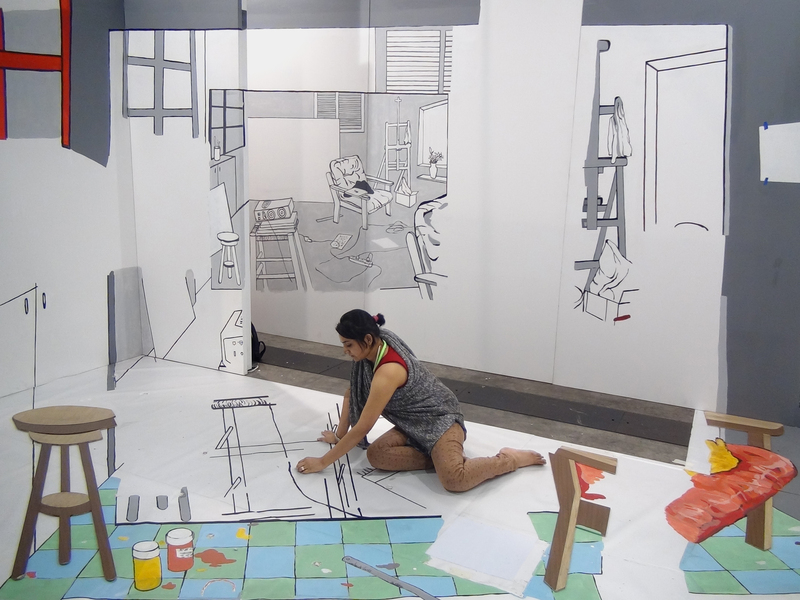 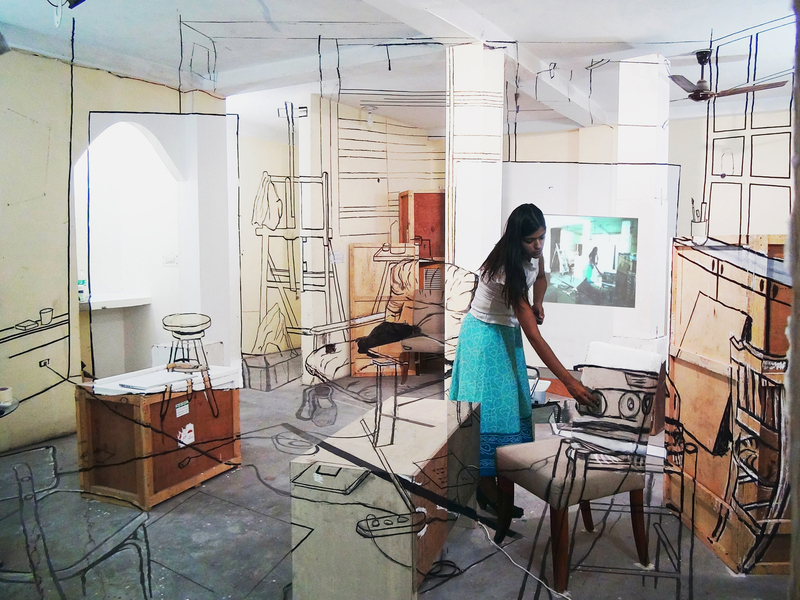 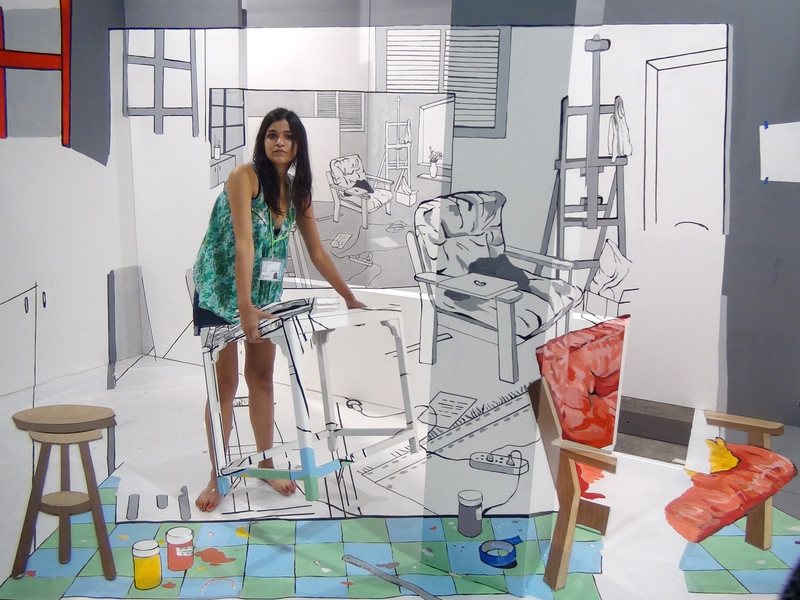 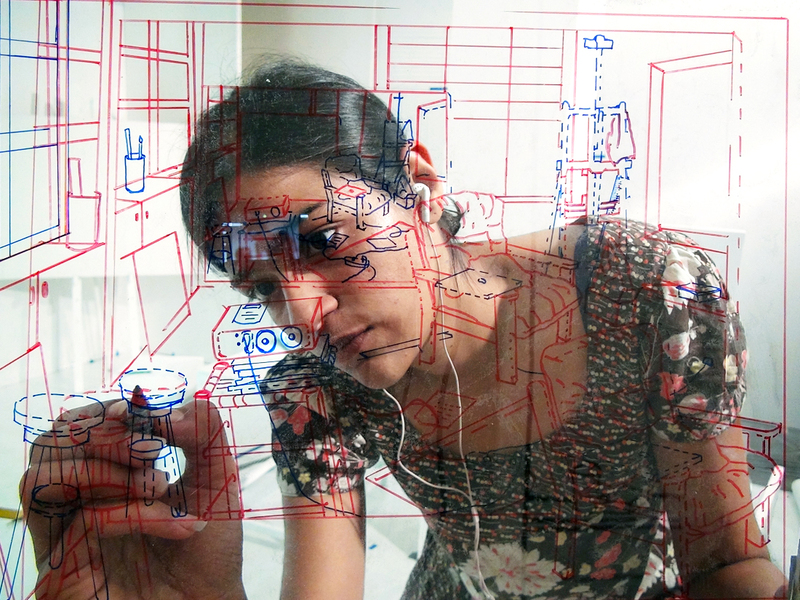 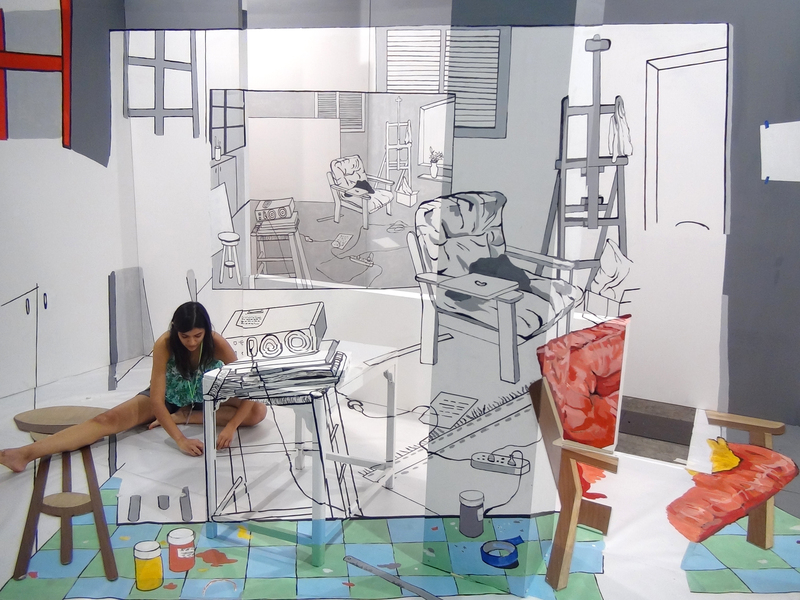 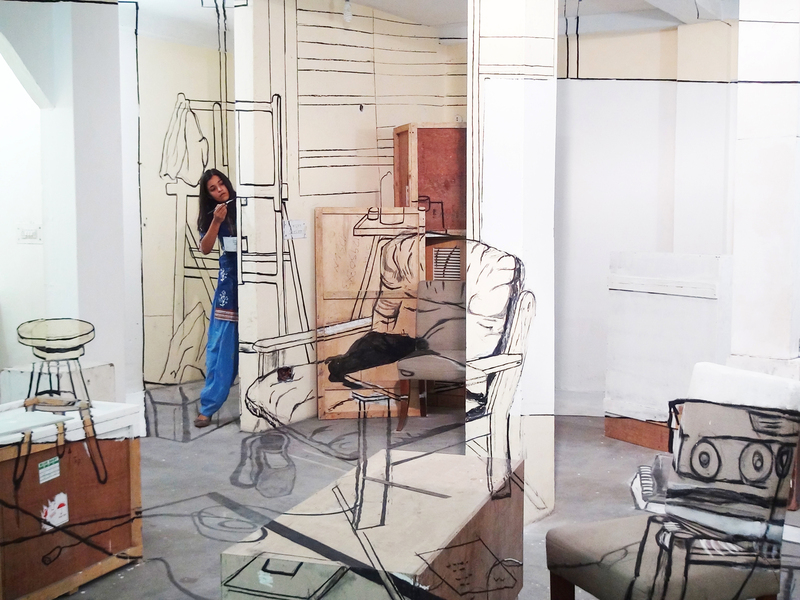 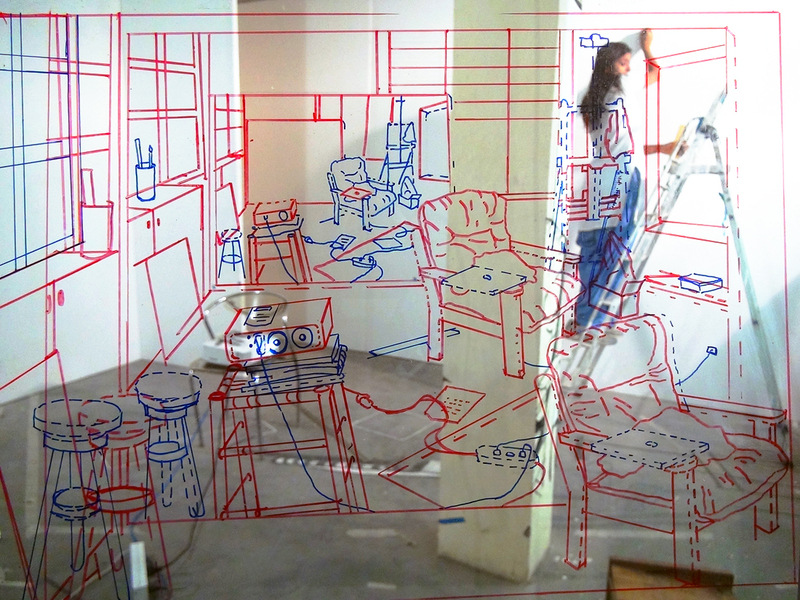 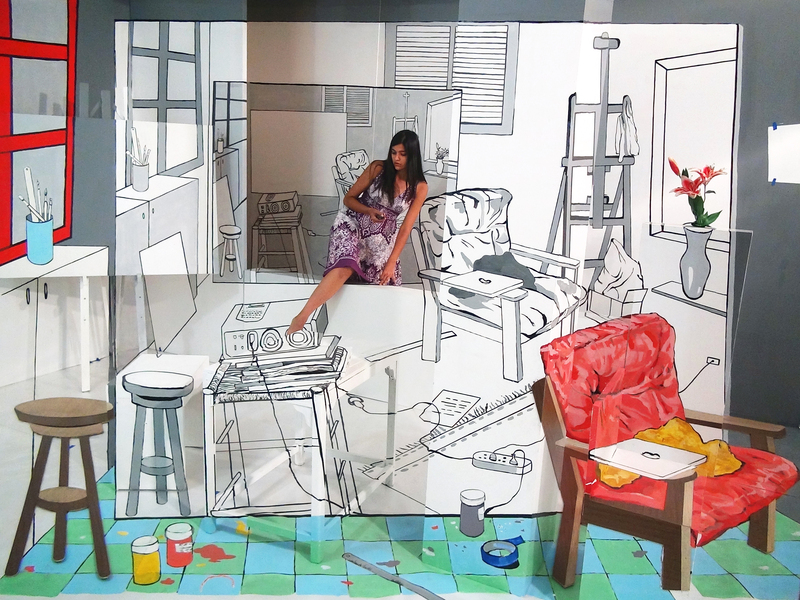 The image depicts a colorful studio within which is a monochromatic painting (of the studio), within which is also a painting (of the same studio) suggesting an infinity loop where image reflects environment. 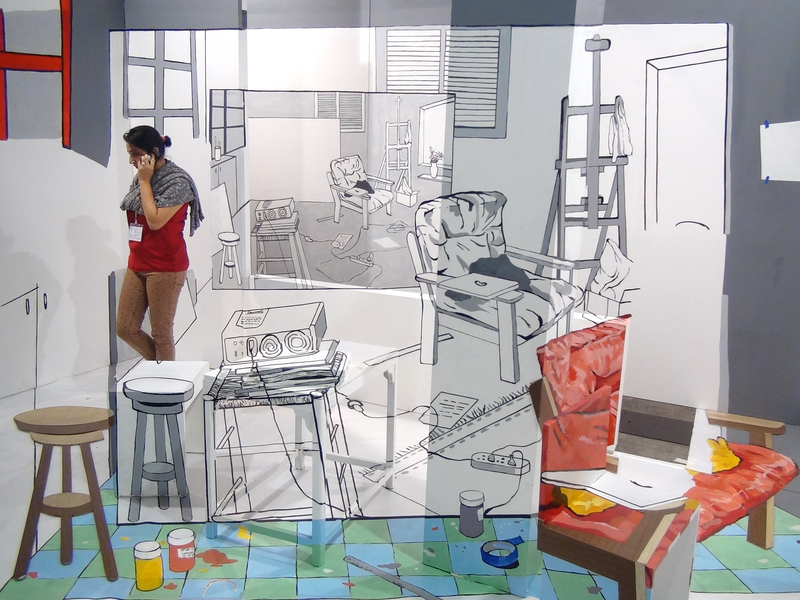 Viewers are allowed to walk through not just the “backstage” arena of the studio where the painting rests before its “onstage” appearance at fairs, museum and galleries, but also in a literal way into the messy, tangible 3 dimensional construction of the elegant 2 dimensional “painted” image, appearing onscreen. 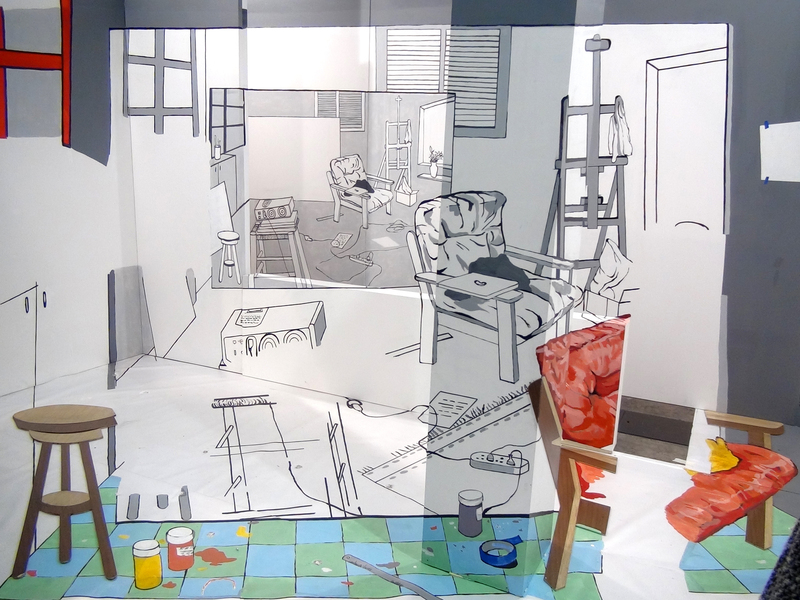 In negotiating this bizzare micro-universe of onscreen/off-screen the artist asks viewers to reconsider notions of the real and represented, object and image, knowledge and perception, fact and illusion, actual and virtual, exposing the fragile set of givens upon which meaning is constructed.